Photo: The Rev. 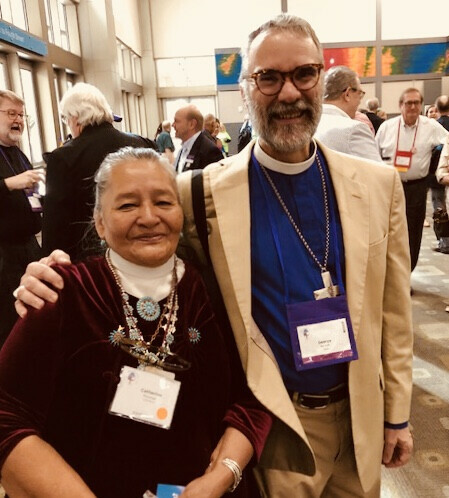 Catherine Plummer from Navajoland with Bishop George Sumner. Greetings in Christ from Austin. Convention officially starts today, but the side of the event which is more like a church bazaar and reunion is in full swing. Guests from around the Communion are here, and the exhibit room has vendors whose wares include clergy shirts, social causes, and seminary educations! Clergy greet friends in the lobby. Koinonia includes the grassroots. Last night was the listening session for Convention’s expression of #MeToo. It had morphed into a liturgy of testimony and repentance against a musical backdrop of Taize, all of which I thought was a wise. The personal statements, read by bishops and protecting privacy, were from young and old, men and women. As a theologian, I was struck by the need, here as everywhere, for a robust doctrine of sin and redemption to come to terms with the brokenness of the Church. On a happier note, Stephanie and I enjoyed dinner with Bishop Michael and our friends, the deputies from North Dakota. Be assured that your deputation is working diligently and is led very ably by Mother Victoria. The major resolutions concerning the Prayer Book and marriage are still in committee. Let me remind everyone that, no matter the outcome of these debates here, we will remain steadfast in the teaching of the Church catholic and continue with traditional Prayer Book worship. Keep praying for us!